Jul. 19, 2013 3:00 p.m.
Just west of the hamlet of Falun, approximately thirty-six (36) kilometers west of Wetaskiwin, is a collection of buildings on the north side of Highway 13 displaying signs advertising ‘authentic’ Mexican cuisine. At a quick glance, the site doesn’t appear to be anything special but none-the-less the signs and colorful yellow buildings entice cars to leave the highway and have many curious people checking it out. This family owned and operated restaurant brags their food is, “as authentic Mexican as North Americans will accept”, referring to peppery hot sauces which are served as a side dish. 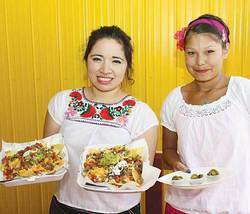 As the business expanded, Maria started “Marvelous Mexican Monday” in the upstairs floor of the restaurant across the street from the park and overlooking Pigeon Lake. We eventually bought the property we are now on and moved the liquor store here from next to the Falun Co-op, and began the remodelling and building process.” Brady operates a liquor store adjacent to the restaurant. Maria told this reporter that she needs to go to Edmonton to get authentic Mexican ingredients. Maria has a vision for the seasonal restaurant that opened in the middle of July of 2012 and in April of 2013; providing 100% authentic food that is 100% fresh. “People expect that of us. Also every Friday and Saturday night I try to do something special or different from the regular items on the menu.” The special on July 12, 2013 featured meatballs filled with cream cheese with tomato and chipotle sauce, Mexican rice, Mexican fried beans (3 cheese) and for dessert, Mexican Flan, a cheese cake with caramel…and all for $10. “With my food I never make it hot as many are unacustomed to the hot spices. I make it flavorful but nothing hot. In Mexico we love to do hot but here we have the hot sauce on the side. It’s the spices I cook with that make the food very flavorful.” Maria makes her own special hot sauce using, “the hottest pepper in Mexico, the Habanero”. Enjoy a summer afternoon or evening on the 650 square foot patio equipped with mosquito netting and a large mosquito machine. Maria’s special homemade hot sauce (a must for the very brave). Maria’s special desserts (leave room for these).Watch for the Friday and Saturday specials that are not on the regular menu. Panchos – tortilla chips, melted cheddar cheese, Jalapenos, chicken/pork or beef, salsa, guacamole and beans (just the correct amount of each ingredient). Encourage Brady to tell his story about the ups and downs as a professional musician that took him across North America and finally landing in Falun (but allow enough time as Brady has packed many more years of living into his present age than most people in a lifetime).